What flowers do you plan to have at your wedding? Do you have specific colors? Will your BMs bouquet match yours or be different? I definitely want peonies, and maybe garden roses, and something green....but I'll leave that up to the experts. Our flowers will probably include blush, ivory, and green, and I think mine will match the BM's. My bouquet will be blush Peonies, Ivory Roses & white Hydrangea. My BM bouquets will be white Hydrangea with light pink spray Roses. I with all of you on the peonies, garden roses and hydrangeas! I'm thinking that for my bouquet though, I'll add a few of those coral colored peonies. I also love lilacs, so I'd love to have lilacs, too. Basically, the abundance of flowers is why our wedding is in May haha! I'm thinking peonies and hydrangeas, but will leave most of it up to the florist. I will probably do the same or similar flowers for the BM bouquets, but mine will likely have more colour in it. Hydrangeas for sure...not sure about anything else at this point. 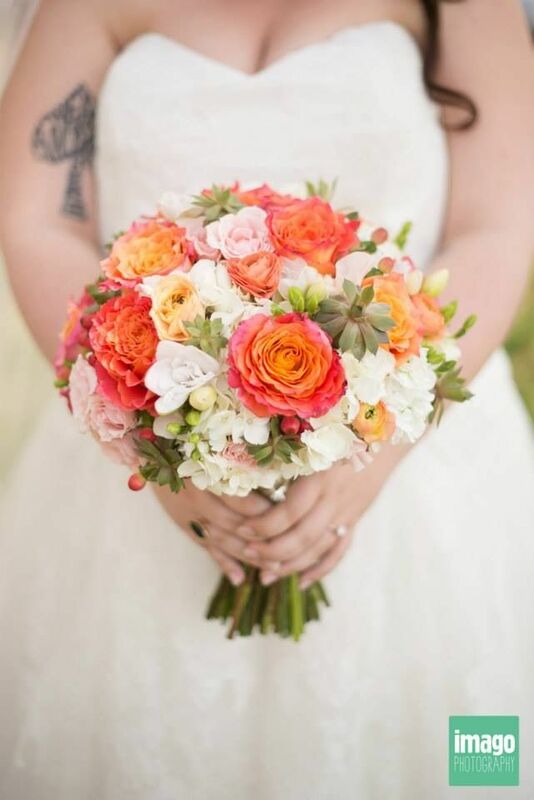 We just met with our florist last week - my main color is coral, so she suggested free spirit roses, which I had never heard of before but are gorgeous! Those will be the main flowers for my bouquet, mixed with white freesia, succulents, and some hypercium berries. I like a bouquet with some texture and that isn't perfectly round with all the same type of flowers - I'm hoping it turns out like this! Bridesmaid bouquets will be similar but with more white, because their dresses are coral. I don't want the bouquet to blend in with the dress. My bouquet is straight ivory roses. My bridesmaids will be like mine but smaller and a little bit of freesia; my maid of honor will have a slightly larger bouquet than the other bridesmaids but still smaller than mine. Our main flowers are ivory roses (both my grandmas' favorite flower is a rose) with hints of freesia. My dad's cousin a florist so she is working on it for me (which is awesome because I know nothing about flowers). I have no idea what the names of flowers are, I just want a variety of small and large ones with some baby's breath as fillers. The colors will be deep purple, lavender, and ivory (my wedding colors are deep purple and silver). I'm actually not going the traditional route and instead I'm getting sola flowers! I just discovered them yesterday from a fellow Knottie; sola wood is also known as balsa wood, and it's soft and malleable enough that it can be used to create flower petals. Apparently it's a big deal in the craft word. Etsy, of course, has tons of shops to choose from. I'm about to place my order for my own bouquet and my bridesmaids bouquets, which will be smaller, same flowers, but all ivory (their dresses are deep purple so it'll really stand out). I'm planning on getting sola corsages as well for my mother, his mother and grandmother. I figure the men will just throw their boutonnieres away so those will probably be real flowers, and I'll get a real mini bouquet to toss. I'm so glad I discovered sola flowers because now I get to keep my bouquet for years and I won't need to worry about them dying! Coral peonies and Lilacs are my two must haves. Everything else is filler! My daughter is having garden roses, green hydrangea, seeded eucalyptus, dusty miller and...I can't remember the other . Her bouquet will include peach and coral roses with a bit of yellow and green. She also wants to include a poppy or two because that's what the grandkids called my dad. The BMs will be similar but with more white.